You'll find plenty of promotional and bonus offerings on RealBet's web site, designed to both attract new customers and maintain current bttors, as they look to continue to grow and develop their clientele. It's as simple to get as it is to do the math. To garner the 100 percent match sign-up bonus from RealBet, all you are required to do is make your first deposit with them and it will be instantly doubled up to a value of $1,000. The combined bonus and deposit total are governed by a 5x rollover on sports betting, or 25x on casino gaming. But you can couple the two forms of wagering together in order to get to the rollover total in a quicker fashion. The best part about RealBet's sign up bonus is you don't need a bonus code. It isn't necessary to utter any magic words. Just put the money into the account, watch it double and then get down to the most important matter - making winning wagers. One of the drawbacks to RealBet is that their deposit options are extremely limited. You basically have two choices - Visa or MasterCard. They allow a maximum of $1,000 per deposit, with a minimum deposit of $50. Every single time you deposit funds into your RealBet account it will pay off for you. An automatic 20 percent reload bonus worth up to $200 instantly kicks in the moment you make a desposit and use the code RELOAD20. Every bettor wants to make money via their online sportsbook account and with RealBet's unique reload bonus, it's paying out before you even place a bet. You can't beat those odds. In its never-ending drive to attract more U.S. customers, RealBet offers a 20 percent parlay challenge bonus on many games. Just package a wager on five NFL, NBA and NCAA football and basketball games and if you hit on your bet, RealBet will add an additional 20 percent payout on top of your winnings. Depending upon the parlay package played, payouts can vary from $120 up to $250,000. When a company is looking to expand, one of the best testaments to its trustworthy and reliability is the word of mouth of its clientele. RealBet knows this and that's one of the reasons why in order to grow their business, they offer a refer a friend bonus. Simply refer a friend to RealBet and when they sign up and make their first deposit, you garner a 25 percent bonus of the amount of their deposit, up to $300. And there's no limit to how many friends you can refer and cash in on. So tell two friends, then tell two more friends, and so on, and so on . . . So many in business today are puzzled as to how to make the internet pay dividends but RealBet has come up with a solution to that problem for you. Customers who like them on Facebook, or follow them on Twitter and Instagram will instantly qualify for a friendship prize of $10 to use in any manner you choose, from wagering on their wide selection of sportsbooks offerings to playing any one of their vast variety of casino games or video poker. Simply click your mouse on the icon and RealBet will show you the true value of being friends with benefits. You won't find any fancy bells and whistles when you log on to RealBet.eu. It's a meat and potatoes web site but it's very functional and extremely easy to navigate, offering wagering on all the sports you'd expect to find - NFL, NBA, MLB, NHL and NCAA, as well as golf, tennis international soccer, NASCAR, boxing and MMA. RealBet offers a live betting option on many of its sports and an in-depth stats and information package on all upcoming games is just a click away. The RealBet casino offers a vast slate of table games and both slots and 3D slots. The casino site features state of the art graphics and is easy to play, with no download required on any mobile device. There is no minimum deposit required to garner the RealBet 100 percent sign up bonus. The maximum amount offered via the RealBet sign up bonus is $500. The rollover requirements relating to the Real Bet sign up bonus are a 5x rollover on sports betting, or 25x on casino gaming. Reload bonuses. Refer a friend. Parlay challenges. Social media incentives. 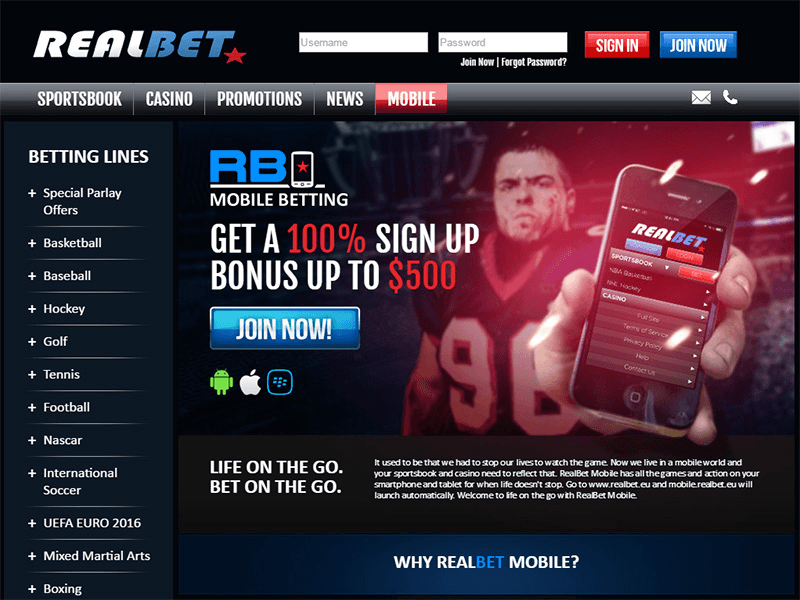 Looking to drive its customer base, RealBet's promotional offerings are vast and cover a wide array of offerings. When you are the new kid on the block trying to carve out a piece of the ever-growing online sportsbook industry, getting bettors on board with your site is Job One, and the folks at RealBet aren't afraid to try something different in order to make that happen. There's also a very strong player rewards program at RealBet, and bettors are permitted to turn in their rewards points in exchange for cash deposits back into their wagering account.